The Acid Hybrid ONE combines the go-anywhere rugged appeal of Cube mountain bikes with the comfort and adaptability of their touring bikes. Sleek, affordable, easy to ride and even easier to slot into your daily life, it’s a Bosch e-bike for all reasons – and there’s even a trapeze frame version, so everyone can find the perfect fit. The powerful and reliable Bosch Active Line Plus drive unit and battery slot elegantly into the custom aluminium frame, providing smooth, silent assistance for your pedalling. 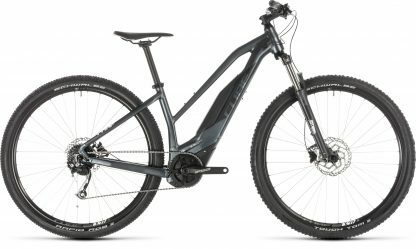 Slick-shifting Shimano 9 speed gears and powerful Shimano MT200 hydraulic disc brakes mean you’ll always be able to find the right gear and control your speed safely, while a plush Suntour suspension fork and big, grippy Schwalbe tyres give a comfortable, sure-footed ride. From city streets and the daily commute to weekend off-road exploring, the Acid Hybrid ONE has got it covered.